This one page note details some of the main actions Apollo 13 astronauts needed to make in order to get back to Earth safely after a failed flight to the moon. It sold at auction for $84,100. NEW YORK — A keepsake from NASA's nearly disastrous Apollo 13 moon mission of 1970 nabbed top spot in an auction Monday (March 25) of more than 300 artifacts from the early years of the U.S. space program. 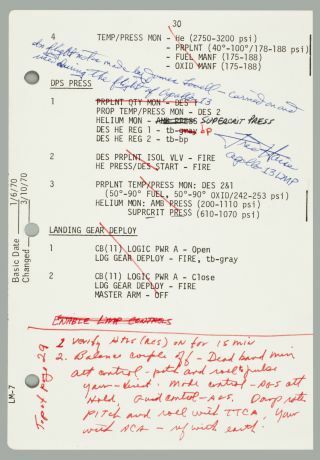 The space history artifacts — sold by Bonhams — included an engine burn note detailing how the crew can return to Earth annotated by astronaut Jim Lovell during the Apollo 13 mission that went for $84,100 and various items from the space agency's first mission to the moon. "Documents from Apollo 11 also impressed bidders, including an Apollo 11 Command and Service Module maneuver card selling for $64,900 and a postal cover taken to the moon during the mission which achieved $35,000," officials from Bonhams wrote in a statement. "An Apollo 11 activation checklist carried to the lunar surface realized $25,000." Bonhams Auction House sold more than 300 space artifacts on March 25, 2013. Pieces from the Apollo missions (including 13 and 11) were sold, as well as other items from the space program's history, including a flight plan from the Apollo 11 moon mission, seen here. Although some items in the auction were previously owned by Apollo 11 astronaut Buzz Aldrin, none of the articles being sold were currently owned by the moonwalker. Officials with the auction house noted a few pieces of space history that outperformed expected estimates. An Apollo 17 lunar surface checklist sold for $28,750 largely because it was "heavily soiled with lunar dust." "As auctions like Bonhams' recent sale and private efforts such as Jeff Bezos' ocean salvage of two Apollo F-1 engines demonstrate, interest in collecting and preserving space history artifacts remains strong," Robert Pearlman, editor of the space history-focused collectSPACE.com, a SPACE.com partner site said. "These tangible remnants of our early space exploration efforts may change hands over the years, but in doing so they are saved for future generations." Bonhams Auction House sold more than 300 space artifacts on March 25, 2013. Pieces from the Apollo missions (including 11 and 13) were sold. Pearlman also notes that these artifacts can serve as artwork for their new owners. "Checklists and flight plan pages may not be conventional works of art, but to a space history enthusiast, they are an eye-catching display of what it took to fly astronauts to the moon and back," Pearlman said. Bonhams will host another "space history" sale in the spring of 2014.